(Dulles, VA 21 April 2013) - Orbital Sciences Corporation (NYSE: ORB), one of the world's leading space technology companies, today completed a successful test launch of its new Antares(TM) rocket from the Mid-Atlantic Regional Spaceport (MARS) located at NASA's Wallops Flight Facility in eastern Virginia. Lift-off took place at 5:00 p.m. (EDT) followed by payload separation approximately 10 minutes later and mission completion at about 18 minutes after launch, once the rocket's upper stage completed planned maneuvers to distance itself from the payload. The test flight demonstrated all operational aspects of the new Antares launcher, including the ascent to space and accurate delivery of a simulated payload to a target orbit of approximately 150 by 160 miles, with an inclination of 51.6 degrees, the same launch profile it will use for Orbital's upcoming cargo supply missions to the International Space Station (ISS) for NASA. "Today marked a giant step forward for the Antares program, with a fully successful inaugural flight of the largest and most complex rocket the company has ever developed and flown, said Mr. David W. Thompson, Orbital's Chairman and Chief Executive Officer. 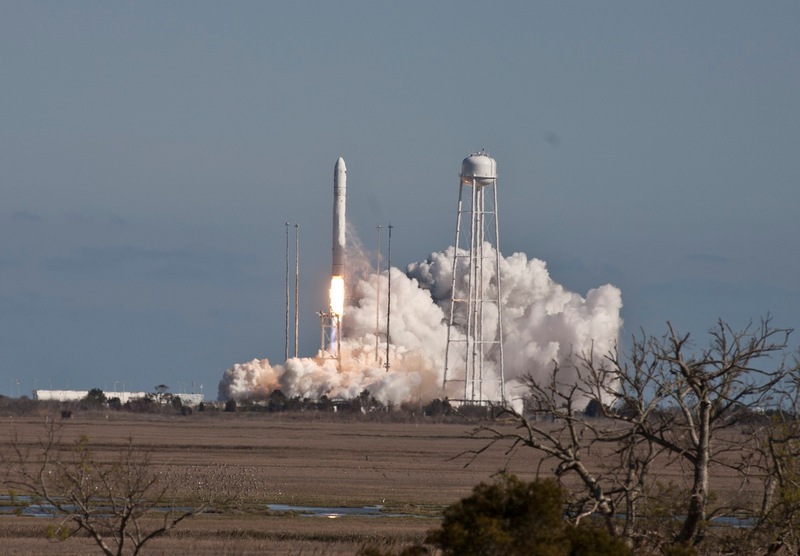 "With its successful test flight from the MARS pad at Wallops Island, we will now move forward toward completing the full demonstration mission of our system to resupply the International Space Station with essential cargo in just a couple of months." 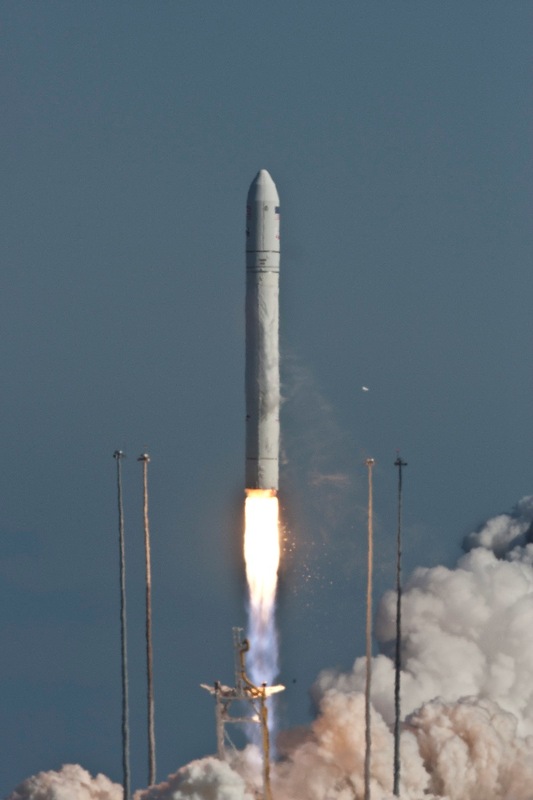 Today's test launch, dubbed the Antares A-ONE mission, was conducted under the Commercial Orbital Transportation Services (COTS) Space Act Agreement Orbital entered into with NASA in 2008. Following a successful demonstration mission to the ISS of Orbital's complete system in mid-2013, including the launch of the first Cygnus cargo logistics spacecraft, Orbital will begin regular operational cargo delivery missions to the Space Station under its Commercial Resupply Services (CRS) contract with NASA. The $1.9 billion CRS contract calls for the delivery of up to 20,000 kilograms of essential supplies to the ISS over eight separate missions from 2013 to 2016. In addition to supporting cargo missions to the ISS, the new Antares rocket will offer other commercial, civil government, and defense and intelligence customers affordable and reliable medium-class launch services for medium-class satellites that do not require the industry's larger, more expensive launch vehicles. Moving upward from its traditional focus on small-class rockets, Orbital's Antares medium-class launcher will provide a major increase in the payload launch capability that the company can provide to NASA, the U.S. Air Force and other potential customers. It is designed to launch spacecraft weighing up to 14,000 lbs. into low-Earth orbit, as well as lighter-weight payloads into higher-energy orbits. Orbital's newest launcher is currently on-ramped to both the NASA Launch Services-2 and the U.S. Air Force's Orbital/Suborbital Program-3 contracts, enabling the two largest U.S. government space launch customers to order Antares for "right-size and right-price" launch services for medium-class spacecraft. For more information on Antares, visit http://www.orbital.com/Antares-Cygnus/.